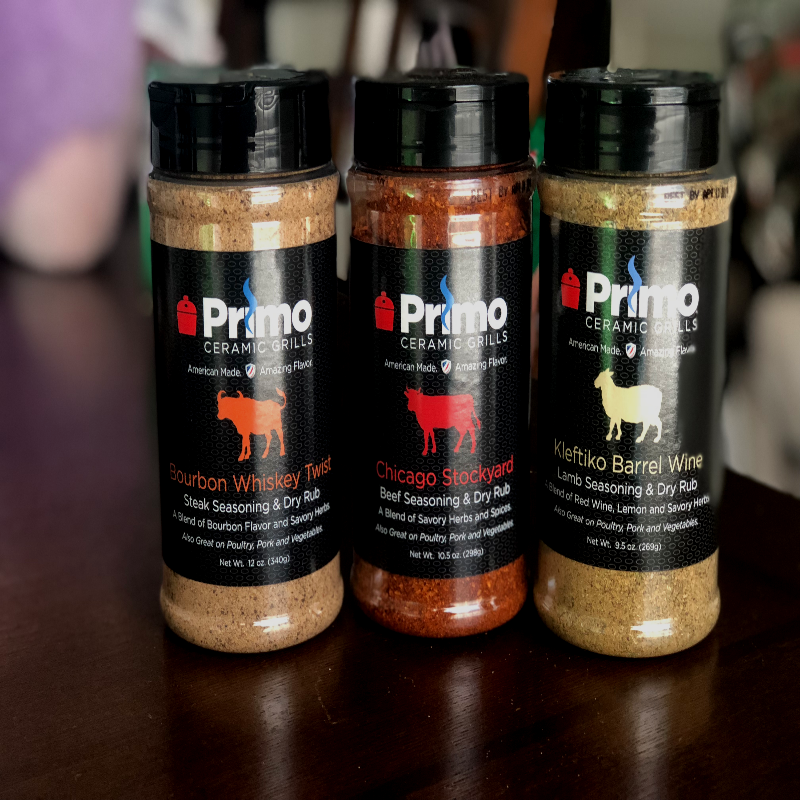 Whether it is beef, steak, or lamb, Primo has just the right seasoning for you. Impress your friend with seasonings made just right for your cut of meat. Let them marinate in a dry rub to enhance the flavor. Spice up your grilled food this summer with Primo seasoning. In 1986 George Samaras finished his tour of duty with the Greek military and started a career racing sailboats and captaining a yacht which provided excursions to tourists through the Greek islands. I’m 1988 he met his wife Kelley, an American and after marriage and a few years in Greece, they moved to America. While roasting a Turkey on his father in laws kamkado grill, he fell in love with it. He shared it with all his friends and family. After much interest, several years of development, he created his own. Primo which means “the best” in Italian, soon grew from a 700sqft room to a now 92,000sqft building and is available in 24 countries. Each blend of seasonings includes fresh products such as fresh herbs, spices and oils to help the taste stand out. Each seasoning can be used as a dry rub or added to cooked meats or vegetables. With the taste of bourbon, this seasoning also has hints of cracked black pepper, seeet cane sugar, brown sugar, dried tobasco pepper and celery. While it’s main recommendation is to be used on steak, it is also great onbeef, pork, poultry and vegetables. This seasoning is great with any cut of beef. It also does well with steak, pork, poultry and vegetables. This seasoning has hints of paprika, garlic, an cho chili peppers, worsteechire and sea salt. We have used this on our burgers and steak and it has received many compliments! Red wine, mustard, rosemary, and citrus make up the bulk of the flavor in this seasoning. It’s name “kleftiko” is Greek for “Thieves” and the story goes peasants stole lamb from farmers to survive. These products may be found at the link provided throughout this post.